Apologies for these awkward lines, I am no Thomas Gray - but I feel the pain of not being able to experience the wonders of sound is probably impossible to describe in words. Those of us who have been bestowed with the control of best of what nature can give us - the 5 senses - we live in a state of utter ignorance. Our erudite minds keep us pre-occupied with fluff and it is almost impossible for us to imagine how life is for those who have not been so fortunate with the senses. Of all the senses, which we are so used to own - hearing is one which is taken for granted most. Probably because it is truly not possible to experience a life full of the vacuum of utter silence, may be except only when and if we get a chance for spacewalk! "I am just as deaf as I am blind. The problems of deafness are deeper and more complex, if not more important than those of blindness. Deafness is a much worse misfortune. For it means the loss of the most vital stimulus- the sound of the voice that brings language, sets thoughts astir, and keeps us in the intellectual company of man." "Blindness separates us from things but deafness separates us from people." I guess nothing can better describe the plight of hearing impaired people. The need for human connect is the most fundamental of our desires. And the loss of hearing puts people into a spot where the connection is nearly impossible to sustain. But why am I today talking about hearing and the loss of it? On the occasion of the World Hearing Day on March 3rd, I was invited to be part of an awareness event about hearing loss and measures to rectify it to the extent possible. This event was organized by Cochlear India, Brett Lee, who is their Global Hearing Ambassador visited the same to share his association with the cause. But the highlight of the event was not Brett or their new discreet hearing aid invention, Kanso™, but the 9-year old Komal who was present there with her mother. 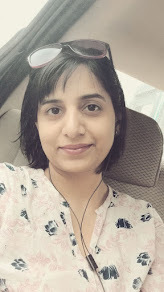 She is a regular girl-next door but what sets her apart is the fact that despite being hearing impaired she not only hears perfectly but also is confident to live her life to the fullest. This was made possible by the awareness and will of her parents and of course, the pioneering work by Cochlear India. It was interesting to hear Brett speak about his association with this important cause. While we did not talk about #SoundsOfCricket :) - we did get to interact with him to find out more about the work Team Cochlear has been doing. Cochlear make the most amazing of the machines (sound processors & implants) to provide corrective hearing (pretty much like spectacles for eye problems). With their newest invention Kanso™ - they are truly revolutionizing the way hearing impaired people can get fulfilment in life. As much unfortunate it may be, the sight of a hearing aid has been ridiculed knowingly or unknowingly. While it may be easier for adults to deal with the social stigma associated with such devices - for a child this can be totally devastating. This leads to several psychological problems which they end up fighting all through their adulthood. 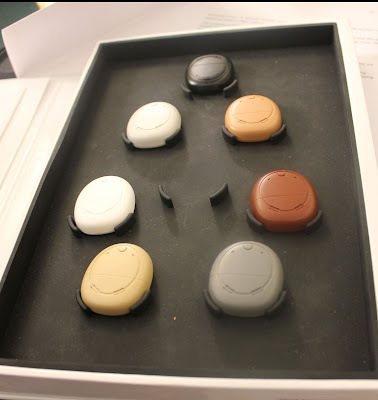 Cochlear Wireless Phone Clip, Wireless Mini Microphones, a Remote Control. Kanso™ is water- and dust-proof. Kanso™ comes in eight colors that can blend in with the hair colour. Having only one button makes it simple to use. This was quite an eye opener session and made me think and thank God for making me respect the gift of hearing. We took our elder one to the event for a hearing screening. We were nervous how the process would be and if she will actually go through the test, being the bumble bee toddler she is, but it was a quick and easy process. The technician used a small hearing probe like ear phones and the machine did its job of testing the hearing. 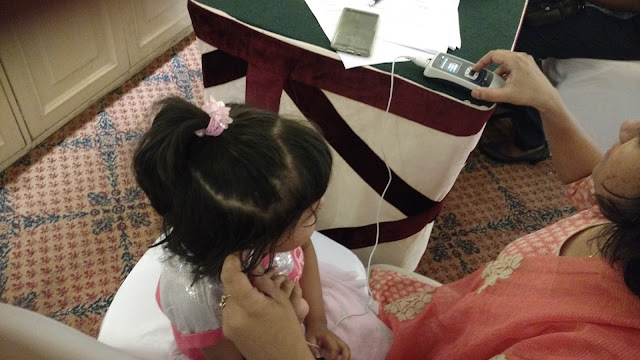 After going through this process, I realized that this hearing screening is something which should become main-stream and a common practice as part of the growth monitoring of a child. An early diagnosis of potential hearing problem can actually give the doctors a chance to reverse or avoid the possible loss of hearing! But ignorance is certainly not bliss in this case. More often than not this is indirectly discovered through behavioural issues surfacing at a later stage in life resulting from the loss of hearing. And in most cases, it is already too late to take a corrective and further preventive treatment. In some hospitals like the one where I delivered my babies, new-born hearing screening has been introduced. But many a times new-parents miss this important diagnostic. I would strongly recommend you to not to miss this important test for your kids and yourself. The stigma associated with hearing loss can truly be fought only when we are determined to deal with it head-on by being aware and responsible. The love of laughter, the music of birds, the raindrops falling on our heads - each of this qualifies to be the #HappiestSound of our lives. But can we truly enjoy life without the ability to hear these? Through this post, I would like to urge you to spread the word and get a hearing screening done if you have not already! There is lot more to experience in this world than just the silence of vacuum - may we all be able to enjoy these true blessings of life! I was invited to participate in the #SoundsOfCricket Hearing loss awareness event by Cochlear India. This is an information post based on my personal visit. Any medical or hearing aid related query, please contact the respected company. For more information on Cochlear India and their work, please click here.